← Mary Magdalene: Saint or Sinner? Last night (Sunday), I returned from a four-day diocesan youth retreat at the Chapel of Divine Mercy in Deland, Florida. I am so proud that my wife completed her orientation at St. Vincent’s Medical Center today and is now a bona fide employee of Emergency Pregnancy Services. Both of those previously mentioned facts lead me to the admission that I have just not completed the article that should have gone up Sunday night at 8 o’clock. Monday is the feast of St. James the Apostle and, God willing, I will be able to get that post up tomorrow. In the mean while, as I am at home playing Mr. Mom and wishing I could escape to a nice wi-fi network, I post this as bait for the trolls. Archbishop Craig Bates is the Patriarch of the International Communion of the Charismatic Episcopal Church. While this is not an official pronouncement of the Church, it carries a great deal of authority. The last few months I have been approached by several young Christians and asked to defend “infant baptism.” I am not sure, however, that as a Biblical Christian I need to defend a practice that has long been accepted by the vast majority of Christians, including most Evangelical Christians. The fact is that those who support the position of “believer’s baptism” as an act of obedience rather than as sacrament are in the minority. The position they take would ignore the reality that the early Church indeed baptized infants and that this practice was not only the norm but was universally practiced by all Christians until the late sixteenth century. Not only do they find themselves in disagreement with the Church Fathers like Athanasius and Augustine, who were most certainly men of Scripture, but also with the Reformers like Martin Luther and Calvin. Those of who defend the Christian and Biblical practice of baptizing infants need merely offer the defense that this teaching and practice is not only Biblical but is the practice of the Church from Apostolic times. Those who hold to so called “believer’s baptism” are in the ones who need to defend their position. The fact is that their position originates in the post-Reformation Anabaptist movement of the sixteenth century. And, again their position has been rejected not only by Roman Catholics, Eastern Orthodox Christians, and Anglicans, but the vast majority of Churches that grew out of the Reformation. It is correct that the Holy Scriptures does not specially command the baptism of infants nor are there any specific examples in the Book of Acts of an infant being baptized. Though we do find examples of “households” being baptized. The lack of evidence of infants being baptized can easily be explained. The Book of Acts is the record of first generation Christians all of whom were adults. It is not clear what these new converts did with their children. The proponents of “believer’s baptism” would suggest that infants are excluded from receiving baptism since as an infant they cannot make a profession of faith. I wonder how they would deal with the text from the Psalmist, “For you are He who drew me from the mother’s womb, my hope from my mother’s breasts; I was cast upon You from the womb; from my mother’s womb you are My God.” (Psalm 21.10-11) It is clear that in the Covenant God made with Abraham – marked by circumcision – which infants not only could be in covenantal relationship with God but were in covenantal relationship with God. (Genesis 17.10-13) It would seem strange would it not that the same God who brings infants into relationship with himself in the covenant of Abraham would now withhold that relationship from those in the covenant of Christ Jesus who said, “Let the little children come to me, and do not hinder them, for the kingdom of God belongs to such as these.” (Mark 10.14) The word for here for “children” is the Greek word “paidia” which can be translated “babes in arms” or “infants”. Isn’t this the very reason that many who hold to “believer’s baptism” practice “baby dedications” which has little if any Scriptural support and was not practiced until late in the seventeenth century? If we want to obey Jesus and bring the “babes in arms” to Him then isn’t the way to do this baptism? There are five specific references in Scripture to the baptism of entire households. The Greek word for “household” is “oikon” and refers to all who abide in the household including wives, slaves, servants, infants, and children. If children were excluded would not the text had read that only the adult members of the household were baptized? Would we be so naïve as to suggest that in the household of Cornelius, Lydia, the jailer, Crispus and Stephanas there were no children or infants? From the beginnings the Church Fathers – those closest to the actual events of the Scriptures and often the disciples of the Apostles – related baptism to the covenantal act of circumcision. In Colossians 2.9-12, Paul compares the effect of baptism to the effect of circumcision, which took place at eight days old. And, we can see in reading the Father’s that the practice of baptizing children and infants was a common practice as early as the later part of the first century – Apostolic times. Baptism is an act of grace that precedes faith. Ephesians 2.8-9 reads, “For by grace you have been saved through faith, and that not of yourselves, it is the gift of God, not of works, lest anyone should boast.” Salvation is not an act of man, certainly not of man’s reason or intellectual consent, but an act of the love, mercy, and grace of God. Both faith and grace are works of God into the sinful, stubborn, and prideful heart of humanity. Can we deny that the God who gives the most arrogant and hardhearted man the faith and grace to be saved would deny that same grace to an infant? Faith is a glorious gift of God given by the Holy Spirit. Certainly an infant who has been baptized will need to receive and respond to the grace given to them throughout their entire lives. And, for some that will be a “dramatic” or “profound spiritual awakening”. But the gift of grace always precedes the gift of faith. I do not deny the reality that many people, including myself, came to a transforming moment in their life when their relationship with Christ Jesus came alive. They went from having the faith of their parents and church family to having a faith of their own. For many, this moment in time so transformed them that they were set free from the bondages of alcohol, sexual promiscuity, drug addiction and other life controlling problems or sins. Indeed, every Christian should be in a personal relationship with Christ Jesus as their Lord. But is this a failure of their baptism? Or is this a failure of the Church and families to lead our children to such a personal relationship?Isn’t the most powerful “testimony” of God’s love a person who can say, “I have always known Christ as my Lord and Savior?” Yes, I believe the Church needs to be active in awakening people to the reality of the Risen Christ and a life lived in the power of the Holy Spirit. But this doesn’t negate infant baptism. There is no question that the Church has over the centuries misused the sacrament of baptism. There is no question that many have been baptized out of superstition. It is also sad that many parents fail to teach their children the things necessary to walk in the truth or nurture them in the knowledge and love of the Lord. It is a sad fact that there are “baptized persons” all around us that have never come to a living relationship with Jesus nor known the joy of being filled with the Holy Spirit. This is not because they were baptized as infants. How many have made “altar calls” or gone to crusades to “make a decision” and have fallen from the faith? We need remember the teaching of Jesus in Matthew 13.1-19,18-23. The early Christians, who saw Scripture as their authority, were clear that infants were not to be excluded from baptism for to do so would exclude them from the grace of God in the sacrament as well as exclusion from initiation into the household of God, the family of God, the bride of Christ, and the Body of Christ. The Supreme Court of the United States and now legislators around the world have declared that infants in the mother’s womb are not persons. Therefore these precious infants, who are formed and created in the mind of God for His purpose and plan, are denied the basic God given rights of life, liberty and the pursuit of happiness. They are excluded from the community of man. Mothers and fathers have been deceived into believing that life begins at some man-determined time and therefore they can destroy the life of their child. It seems to me, now more than ever, that as the Church we continue to administer the Biblical and historic practice of baptism to infants and so affirm the truth that all life is sacred from fertilization to natural death. Baptism not only conveys the incredible and scandalous grace of God but also strengthens the family and the household of God. 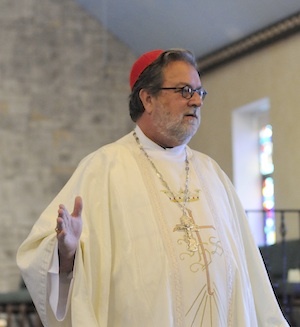 The Most Rev’d Craig Bates is the Patriarch of the International Communion of the Charismatic Episcopal Church, the Primate of the Charismatic Episcopal Church of North America, Bishop Ordinary of the Diocese of the Northeast, and Rector of Cathedral Church of the Intercessor in Malverne, New York. I can see that. The other side, though, does have credible arguments for baptizing only those who have been saved. My question, however, is why is the sacrament of baptism a prerequisite for receiving communion? What is the biblical support for that? Eric, I’ll admit that I haven’t thought about that question before. I mean I’ve never really put a lot of thought into “why” we don’t allow the unbaptized to receive. Just on a quick draw, shoot from the hip answer, I would say that the Sacrament of Baptism is the entry into New Covenant and the Holy Eucharist is a benefit of being under that covenant. A parallel might be marriage. You don’t get to do “marital things” until you are actually married. Likewise, you don’t get to partake of covenant blessings until you are actually part of the covenant. If I had to come up with a scripture on the fly, I might try St. Matthew 15:26, but I would need to consider that one a bit more. After reading the above article, I’m suprised that there is no reference to “original sin”. Any comment? Well, honestly, it’s a little tangential to his issue. The main issue is whether to baptize infants or go with the so-called “Believers’ Baptism.” St. Paul’s Epistle to the Romans makes it perfectly clear that “All have sinned and fallen short of the glory of God.” The issue of how that sinfulness is transmitted or passed on as it were is, as I said, tangential. Were he writing a book, I might wonder why it’s not in there. For an article of that size, I’m not surprised he didn’t address the issue. I don’t know if I’ll address original sin on August 15, but it should definitely come up on December 9. Stay tuned!